At LinkTool Group we provide complete design services. Utilizing the latest 2D and 3D CAD/CAM and simulation software, we can design your complete tooling package – from the concept to production. 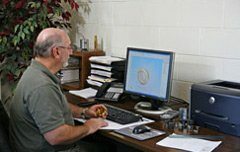 Our design department has over 35 years of experience specializing in precision tooling design. Our team is proficient in working with a wide variety of machines from all of the leading manufacturers — including but not limited to, National Machine, Nedschroff, Sakamura, Waterbury, Asahi Sunac, Nakashimada, Chun Zu, and Sacma. Having an in-house design team ensures your product will be designed and manufactured in one facility, to LinkTool’s high standards, with the fastest turnaround time possible. Have a new product or need to refine an old one? Speak to one of our in-house technical design experts and let us help you bring your vision to life.